Identification: Wings are dark brown or blackish with few light areas. 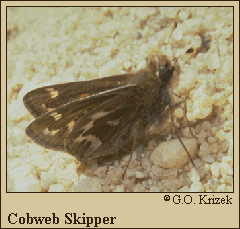 Underside of hindwing has a cobwebbed appearance due to white spots extending along the veins. Subspecies licinus in Texas and Arkansas is very dark both above and below. Life history: To wait for females, males perch near the host plants all day. Females lay eggs singly on or near the host plants. Caterpillars eat leaves and live in nests of rolled or tied leaves. Fully-grown caterpillars hibernate. Flight: One brood from late March to early June. Caterpillar hosts: Beard grasses including little bluestem (Andropogon scoparius and A. s. var. glomeratus) and big bluestem (A. gerardi). Adult food: Nectar from flowers of low-growing plants such as Labrador tea, wild strawberry, blackberry, bird's-foot violet, winter cress, and red clover; also lilac, vervain, Carolina larkspur, and wild hyacinth. Habitat: Dry, grassy openings in woods, pine barrens, oak savannah, open sandy scrub, burned areas, old pastures. Range: Patchy distribution from southern Maine west to Wisconsin; south to central Georgia, the Gulf States, and central Texas.